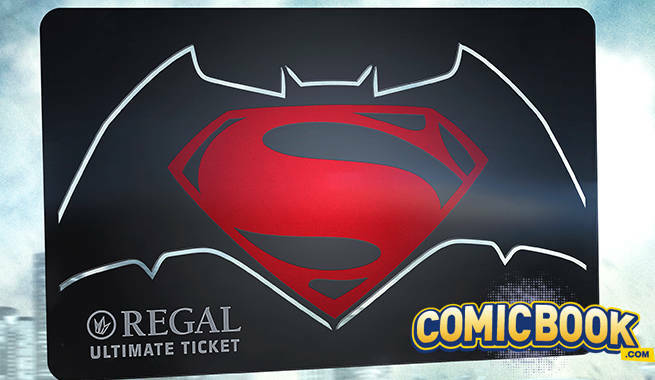 A new collectible is coming for Batman v Superman: Dawn of Justice fans, from Regal Entertainment Group. The BvS Ultimate Ticket isn't just a collectible, though, it's also the key to the ultimate BvS marathon, and we have your exclusive details. With the Ultimate Ticket, which goes on sale Monday February 29, 2016, a fan can see the movie once a day, in any format, for the entire run of the film at any Regal theater. That means IMAX, 3D, RPX, or standard formats are all fair game. The cost of entry is $100, but if you manage to get your hands on one, five large-format viewings pay that off pretty quickly. Only 1,000 Ultimate Tickets are being made available, so you'll want to get your browser ready for refreshing this link Monday morning. The card itself is a collectible, with the Batman logo cut out of anodized steel, and the card owner's name personalized onto the Ultimate Ticket. If you're a Regal Crown Club member, you'll also get 10,000 credits toward your loyalty account. Batman v Superman: Dawn of Justice stars Ben Affleck, Henry Cavill, and Gal Gadot, together as Batman, Superman, and Wonder Woman on the big screen for the first time. Directed by Zack Snyder, the film hits theaters March 25, 2016.